I love Indian food! Heck, I love all food. Fresh ground spices are key to deliciously authentic Indian dishes. Did you know you can quickly and easily grind your own spices in a high speed blender? It works like a charm! My mom works in the relocation department at Michelin. She helps transition Indian families to their new home in the US. This job has many perks – the main one being one-on-one Indian cooking classes with her new friends. This dish originates from a southern region in India called Kerala – it’s a beautiful warm place where coconuts grow (I want to go to there!). 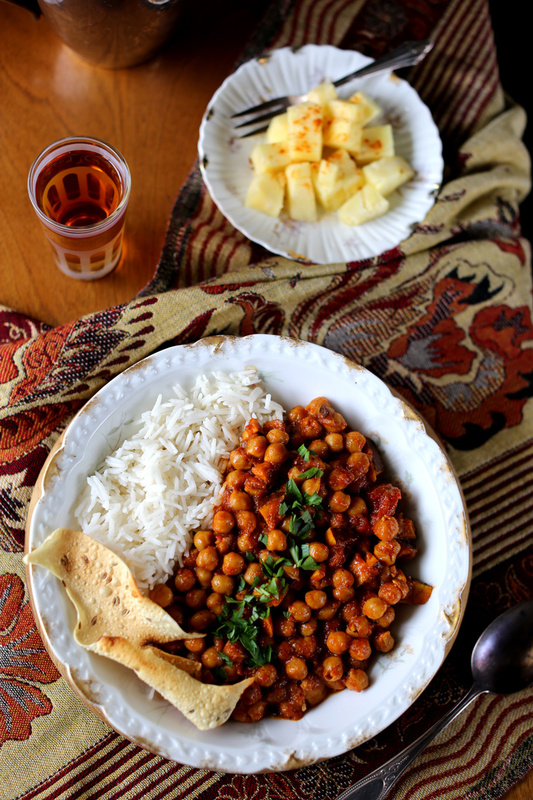 This version of Chana Masala is bursting with sweet nutty richness from fresh coconut. 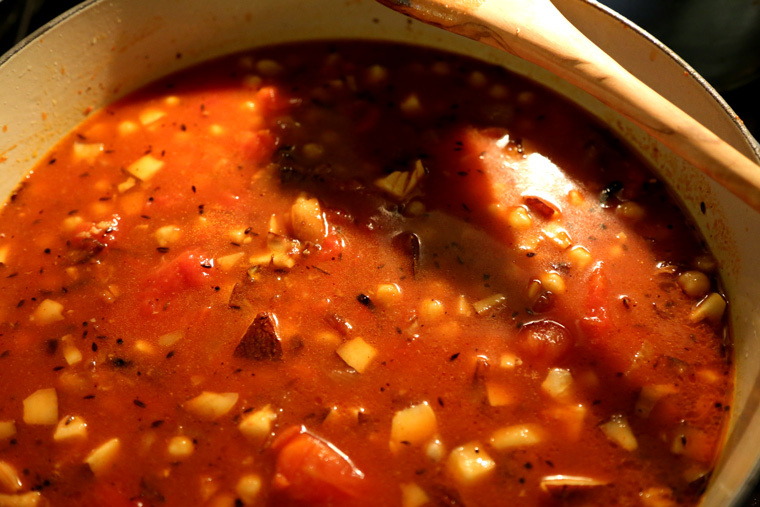 It has that nice layering of fresh spices going with just the right amount of heat to warm you up on a cold day. Oh and this pineapple side dish is my new favorite thing! Just fresh pineapple with a couple pinches of dried hot chili pepper and a pinch of salt. A tropical party for your tastebuds! 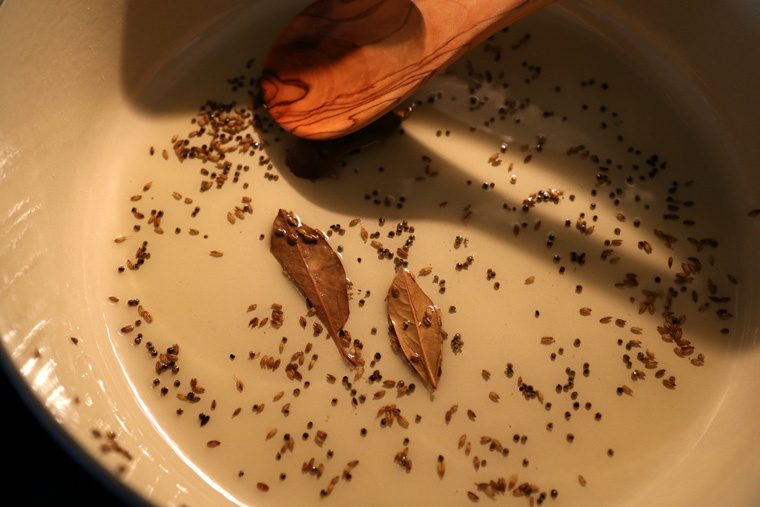 Start by toasting the mustard seeds, cumin seeds and bay leaves in the oil on medium high heat. The seeds will pop and get really fragrant. Add diced onion. Cook until the onions are translucent and start caramelizing. Pulse the coconut, ginger and garlic in the food processor until you have a fine grated texture. Add this to the pan with the remainder or the spices and salt. Sauté on medium heat until toasty and fragrant – about 5 minutes. Add the pre-soaked chickpeas and the can of tomatoes. You may need to add a bit of water so that all the contents are submerged as shown above. Let this simmer with a lid on low for 45 minutes. Cook the rice in a separate pot. 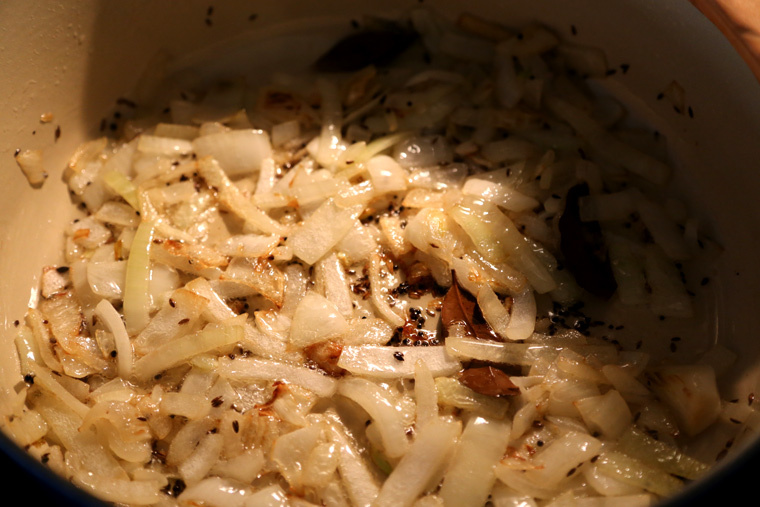 Start by toasting the mustard seeds, cumin seeds and bay leaves in the oil on medium high heat. The seeds will pop and get really fragrant. 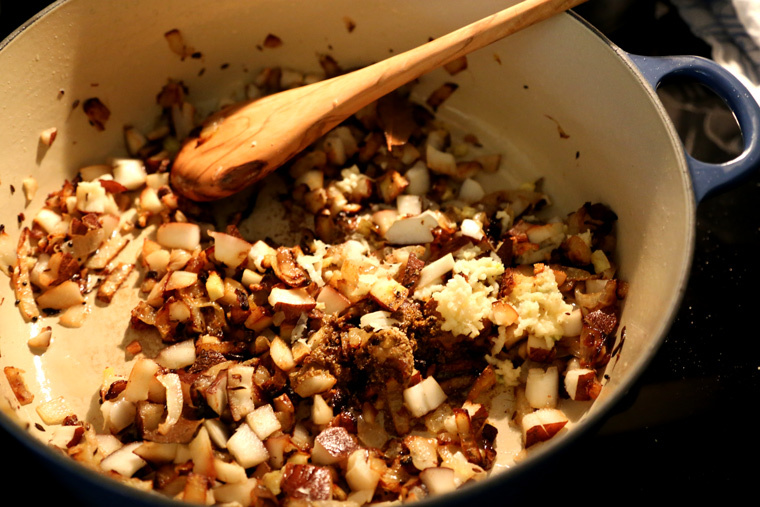 Add diced onion and cook until the onions are translucent and start caramelizing. Pulse the coconut, ginger and garlic in the food processor until you have a fine grated texture. Add this to the pan with the remainder or the spices and salt. Sauté on medium heat until toasty and fragrant – about 5 minutes. Add the pre-soaked chickpeas and the can of tomatoes. You may need to add a bit of water so that all the contents are submerged in liquid. Let this simmer with a lid on low for 45 minutes. Cook the rice in a separate pot 25 minutes before serving. The coriander seed and the dried hot chili peppers can be made to a powder in your high speed blender. 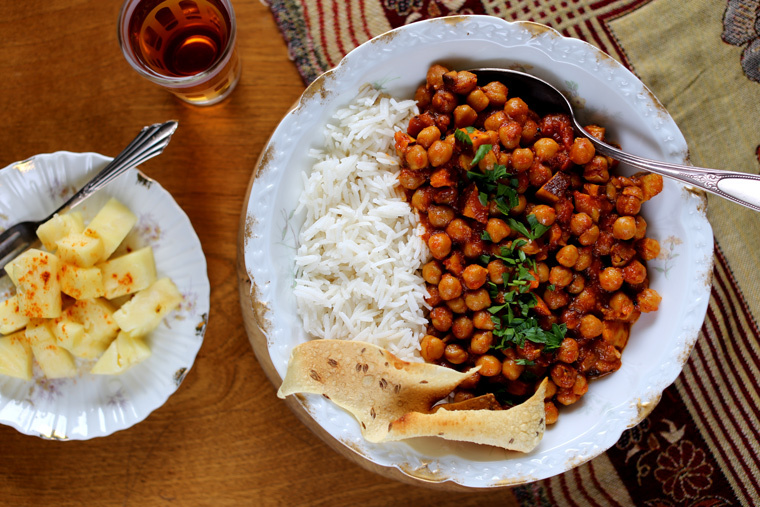 If using dried chickpeas, soak them first overnight so that they are tender and ready to go before you start cooking with them. We opened the coconut by drilling two holes into it with a power drill, then draining the juice (and drinking it!) and then cracking it open with a hammer. This seems a little over the top but it was entertaining and fun. To get the flesh off the shell, just cut away little pieces at a time. Then pulse it in the food processor for a finer texture. I’m new to you. Your halo of flowers attracted me, beautiful. Love your step by step photographs. I’m in Davidson just up the road from you. our farmers market is growing, love fresh produce, and will enjoy preparing your recipes. Do you think your husband could place some pin it buttons on the recipes you send from your blog. They do not show up on my Apple iPad, and I’m new at this. Need so much help! Thank you Grace. Hi Judith! We’re practically neighbors! Thank you so much for the nice comment, I’m so happy you found my blog! I told my husband to add some pin it buttons to the recipes. He’s going to try and tackle that this weekend so stay tuned! Happy pinning! Hi Grace, thank you for your reply. I’ll be looking for those pins. Love your “style”. 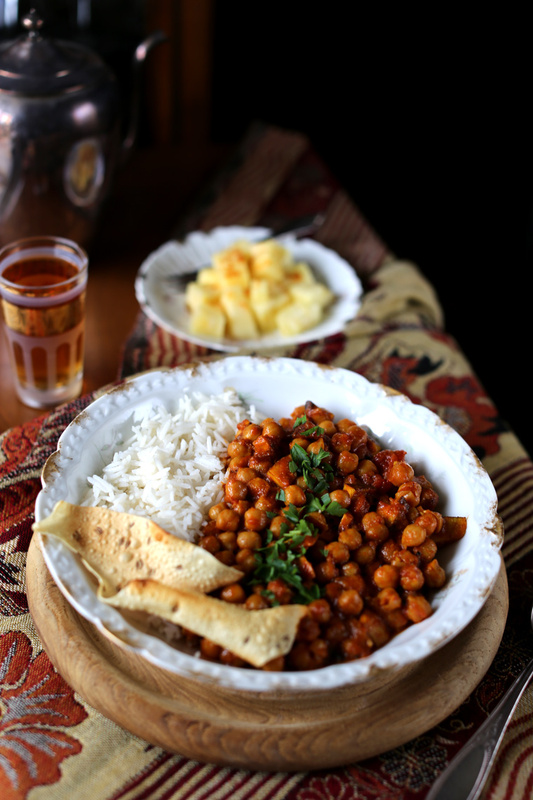 Interesting revamp of chana masala. Usually, coconut is only used in South Indian cooking (chana is a very North Indian dish), but I can see it working here. Just don’t tell anyone in India that you did this – they might be confused! Hi Shikha! Thanks for your comment – I love learning about Indian food (almost as much as I love eating it)! We loved the coconut in this dish – but that will be our little secret! I had this for dinner today and it was so incredibly delicious! I’m glad that I have leftovers for tomorrow! I’ll be sure to try more of your recipes soon – everything already looks so incredibly good! I’m so happy you enjoyed it Melanie! Your comment made my day! Have a wonderful weekend!